Last month’s ferocious weather that wreaked havoc on the West Coast has seen many hours of effort to ensure this weekend’s double header rounds of the Calder Stewart Cycling Series in Hokitika can go ahead. “The weather gods poured more bad news on the proposed round three course in Hokitika destroying not one but two course options,” Jake Rowse from Revolution Events said. The weekend also features the first New Zealander to win a stage of the Tour de France, Chris Jenner, who will ride in the master’s race for the first time for the Christchurch Mitsubishi team. Jenner, who lives in New Caledonian, won the team time trial in 2001 with his Credit Agricole team, a feat that Julian Dean achieved in 2011 with his Garmin-Cervélo team and Patrick Bevan did last year with BMC. Jenner retired from professional racing in 2004, and apart from his Tour stage, he won the overall Le Télégramme in 2002, two stages and the overall title at the Tour of Wellington in 2001, and stages in the Tour de l’Ain and the Tour de l’Avenir in 1999. Rowse said some restrictions have had to be implemented to feeding from team cars and feed zones on the new route but this just created another factor riders needed to consider for what was already a tough racing circuit. Saturday will see an afternoon start for the first ever individual time trial in the series, a 20 kilometre effort on a quick course starting from Lake Kaniere that finishes on the outskirts of Hokitika. 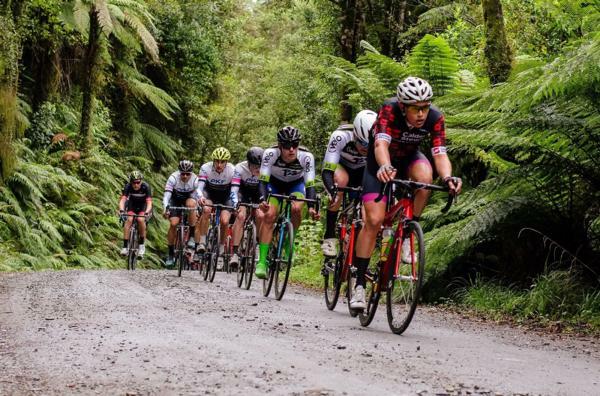 Sunday’s CYB Construction Hokitika Classic starts in Cass Square and heads south of Hokitika to tackle a circuit that includes a six kilometre section of unsealed road and a climb of the Woodstock-Rimu Road. The elite men will tackle four laps to cover 134 kilometres while the master’s men will do three laps to complete 107 kilometres and the women will take on two laps to do 80 kilometres. Riding for Lightworkx Photography Development Team three time Commonwealth Games representative in three different sports Kate McIIroy continued her run of success in the first round of the series in Dunedin and after also tasting success in mountain bike racing this year is well positioning to extend her senior women’s lead in the series. McIIroy’s biggest challenges will come from Kirsty McCallum (Velo Project) and the combined strength of the Mike Greer Homes women’s team. Henrietta Christie (Velo Project) will wear the women’s Under 19 leaders’ jersey with Hannah Bartram from the Mike Greer Homes looming as her biggest threat. The women’s Small Business Accounting Most Combative Rider jersey is up for grabs as Amanda Jamieson (Mike Greer Homes) is in Belgium racing. Young Nelson rider Ethan Batt (Ridge Homes) who won the opening round in Dunedin is racing overseas so the elite leader’s jersey will be worn by fellow Under 23 rider Hamish Keast (Transport Engineering Velo South) who lies third behind his team mate Southlander Mathew Zenovich who is also not racing. Henry Levett (Contract Consultants Cycle Surgery Tineli) who lies fourth overall heading into the weekend will defend the Under 23 leader’s series jersey. Three of last year’s junior track cycling team pursuit world champions George Jackson, Bailey O’Donnell and Corbin Strong are lining up with their Skoda Fruzio team that also includes the Under 19 series leader Ari Scott and the Small Business Accounting Most Combative leader Laurence Pithie, whose burgeoning career is littered with national age group titles on the road and track. Jake Marryatt (Moore Stephens Markhams) and Paul Odlin (Ridge Homes) loom as the elite favourites over the weekend with Marryatt in the best position to threaten Under 23 riders Keast and Levett for the overall leader’s jersey he won in 2017. Timaru cyclist Andy Hilton (Cycle World Emersons) has made an impact in his relatively short master’s cycle racing career, winning overall in Dunedin to claim the series leader’s jersey for the masters 35 to 44 while coming home second in Dunedin means David Rowlands from Wellington (Christchurch Mitsubishi) will wear the 45 to 49 age group leaders jersey heading into the time trial on Saturday. Hilton has Brett Grieve (Cycle Lab Joyride) who is racing in the masters division for the first time this year after moving on from the elite ranks to look out for while Nelson’s Warwick Spence (GJ Gardner Homes Tasman Wheelers) and Justin Sims (Armitage Williams Racing) from Christchurch will both be keen to make life tough for Rowlands in the midden masters age group. Chris Harvey (Cycle Lab Joyride) leads Chris Latta (Cycle World Emersons) in the over 50 age group that should also see Stuart Lowe (Christchurch Mitsubish), Latta’s team mate Paul Gough and Lee Johnstone (Kiwi Style Bike Tours) feature. Craig Domigan (Cycle Surgery Anzco Craft Embassy) will have his work cut out to hold onto the Small Business Accounting Most Combative Rider masters jersey as points are awarded on a climb on Sunday. Racing starts in the time trial at Hans Bay, Lake Kaniere at 2pm on Saturday and the elite men are first away on Sunday in Cass Square in Hokitika at 10am.